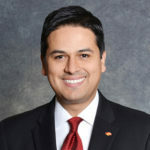 Lomeli went on to graduate from UCLA with a degree in political science and Latin American studies. He spent time working for the Mexican consulate in Los Angeles, but it didn’t take long for Lomeli to realize his true calling was to directly affect the ease and speed at which Hispanic immigrants integrated into U.S. society. SABEResPODER began as a company dedicated to helping immigrants learn how to open bank accounts in the U.S. It quickly expanded into a myriad of issues surrounding the idea of helping someone integrate into the consumer segment of the U.S. Lomeli’s goal is to ensure others have the information and options they need to make good decisions. He says his company does this through a digital Ellis Island of sorts. “We interact with 600,000 plus users each month via SMS or text messaging. They can ask any question they want,” says Lomeli. Topics include things like paying taxes, insurance, medical care, financial planning, etc. The company also provides videos, closed-circuit TV stations and more to help immigrants plug into the U.S. culture, which, Lomeli argues, is more vital to integration than learning a language. As SABEResPODER continues to grow and become more and more sustainable, Lomeli says he sees it becoming an international force for helping immigrants around the globe integrate into their new countries. “If we can continue to leverage technology to help immigrants have the greatest number of opportunities possible, we will also help them be well-informed and succeed,” he says.